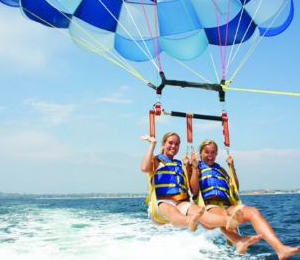 What better way to enjoy your vacation to the fullest than to take to the sky on this exciting parasailing adventure! You get to see the island give way to pearly beaches and intricate reef systems as you ascend above the glistening Caribbean. Let the refreshing sea breeze support your flight as you take in the beauty of the tropical world around you. There is no better way to truly appreciate the structure of Grand Bahama Island, its beaches, and its reefs than to view the whole island network from above. On this parasailing excursion, you can watch the clear shallow waters near the island's beaches transform into the gorgeous deep-blue sea offshore. Spot schools of bottle-nosed dolphins, large manta rays, and sea turtles that call the Bahamas home. As you peacefully glide above this island paradise, you will develop a new appreciation for its natural beauty. The tour begins with detailed safety lessons to ensure you are comfortable and secure on your flight. You can also choose to sail tandem if you want to share this amazing experience with a friend or family member. The boat, outfitted with the most modern equipment, will provide a solid base for your adventure. Let the experts give you the best tips to ensure your enjoyment. Parasailing is fun for a variety of ages, so you can include the whole family on this thrilling adventure. Treat yourself to a wonderful panorama of Grand Bahama Island as you experience the thrill of flying over sapphire water and tropical beaches. You are sure to develop lasting memories of this unique and breathtaking flight off the coast of Freeport. The line is designed to hold up to 10,000 pounds of pressure. The average parasail ride only produces 800 pounds. It is extremely uncommon for the line to break, but if it does, you are never in any danger. If the line should break, the parachute will slowly and gently bring the parasailers to the water. The parachute is designed to land in the water behind the parasailers, never on top of them. Your lifejackets will allow you to comfortably float as the boat will immediately pick you back up. Our custom built parasail boats will allow a smooth and easy takeoff and landing. Each parasailer, or tandem, will slowly lift off the back of the boat from the sitting position with ease, as you enjoy the ride in a comfortable swing-like harness. Each parasailer, or tandem, will softly land on the back of the boat in the sitting position. You do have an option of either a dry landing or "dip" in which the parachute will be lowered in the water. Can we accomodate persons in a wheelchair? We can assist participants out of the wheelchair and onto our boat to parasail. Unfortunately, we cannot take people who are confined to a wheelchair due to limitations boarding the boat and platform. I have been to the Bahamas many times, but Freeport Parasailing: Ocean Motion is one of my favorite trips! It includes everything that everyone should do here. As a Bahamas veteran, I can say only the best about this experience!